Sir Alex Ferguson suffered the ignominy of watching his Manchester United side lose to basement club Blackburn on his 70th birthday. Yakubu gave Rovers the lead from the spot after Dimitar Berbatov had pulled down defender Chris Samba. The Nigerian made it 2-0 when he made the most of slack defending to thrash in, before Berbatov brought United back into the match with a header and shot. 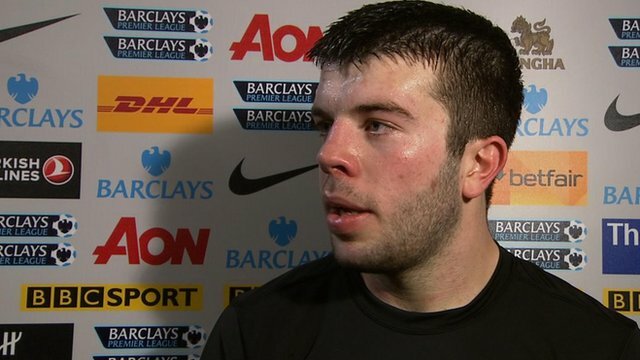 But Grant Hanley spoilt the day for Ferguson when he nodded in the winner. 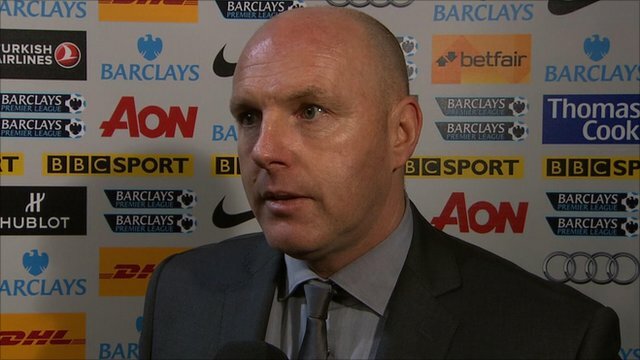 Hanley exemplified the spirit of Steve Kean's Blackburn of late. A draw at Anfield last week has now been followed up with arguably the greatest victory of his managerial career. The win, which bookies had at 28-1 prior to the match, moves Rovers from bottom to third from bottom, and only two points shy of 17th. It should give Kean some respite from the supporters, who have been calling for his resignation. 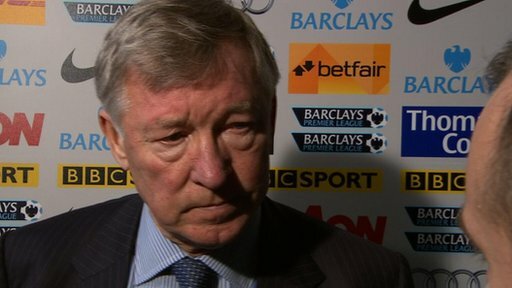 There will not be calls for Ferguson to resign after this loss, but fans and the Scot will be deeply disappointed with United's display, after they missed out on the chance to leapfrog bitter rivals and league leaders Manchester City - and be top of the Premier League going into 2012. United went a goal behind early on when Berbatov grabbed Samba's shirt as a free-kick was launched into the area - and pulled the Congolese to the ground. Referee Mike Dean was perfectly positioned to see the foul and pointed to the spot. Yakubu, with little back-lift, calmly slotted past David de Gea. Rovers would have been expecting to weather a storm from the restart, but there was no storm. Both sides were without many regular first-team players, but Blackburn, buoyed by their draw at Anfield last week, were the far better organised. Ferguson's side were largely limited to half chances, although Nani went close with an angled drive which flew a yard wide, while Javier Hernandez's turn-and-shot also missed the target by a foot. United were rocked again after the break when Yakubu scored his second to the astonishment of those watching. The ball bounced off the legs of Michael Carrick but then Yakubu drifted past a static Phil Jones and angled a brilliant strike past De Gea. But 60 seconds from the restart, United pulled a goal back when Berbatov headed in after Rafael's attempted shot drifted into his path. And the Bulgarian equalised soon after with his sixth in three games - a shot swept in from 10 yards, following brilliant work from Antonio Valencia down the right. It was all set for a final flourish from United - but Blackburn continued to press forward, winning a corner on the left. Morten Gamst Pedersen swung the ball into the area and the impressive youngster Hanley, 20, beat De Gea to the punch with his first header before nodding in the follow-up. 90:00+4:03 The referee ends the match. 90:00+3:04 Luis Nani sends in a cross, Will Keane takes a shot. Christopher Samba gets a block in. Corner taken right-footed by Luis Nani from the right by-line to the near post, Shot from 12 yards from Phil Jones. Blocked by Will Keane. 90:00+2:23 Oliveira Anderson delivers the ball, clearance by Steven Nzonzi. 90:00+0:51 Foul by Morten Gamst Pedersen on Phil Jones, free kick awarded. Free kick taken by Phil Jones. 90:00+0:02 Antonio Valencia produces a cross, David Goodwillie manages to make a clearance. 88:32 Substitution Jordan Slew joins the action as a substitute, replacing Ayegbeni Yakubu. 88:32 The ball is sent over by Phil Jones. 87:18 David Goodwillie takes a shot. Patrice Evra gets a block in. 86:39 Oliveira Anderson has an effort at goal and missed to the left of the goal. 86:31 Phil Jones produces a cross, blocked by Adam Henley. 85:38 Centre by Phil Jones, Christopher Samba makes a clearance. 84:07 Substitution Will Keane comes on in place of Rafael Da Silva. 84:07 Substitution David Goodwillie replaces Mauro Formica. 84:07 Centre by Michael Carrick, Dimitar Berbatov produces a header from deep inside the six-yard box that clears the bar. 84:02 Dimitar Berbatov sends in a cross, Morten Gamst Pedersen makes a clearance. 83:15 Outswinging corner taken by Antonio Valencia from the right by-line, Radosav Petrovic manages to make a clearance. Outswinging corner taken from the right by-line by Antonio Valencia, clearance made by Christopher Samba. 82:50 Ji-Sung Park takes a shot. Blocked by Grant Hanley. 81:43 Oliveira Anderson decides to take a short corner. 81:02 Effort on goal by Ayegbeni Yakubu from deep inside the penalty area misses to the right of the target. Correction - 79:47 Assist on the goal came from Morten Gamst Pedersen. 79:47 Morten Gamst Pedersen provided the assist for the goal. 79:47 GOAL - Grant Hanley:Man Utd 2 - 3 Blackburn Grant Hanley finds the back of the net with a headed goal from inside the six-yard box. Man Utd 2-3 Blackburn. 77:23 Centre by Luis Nani, Christopher Samba makes a clearance. 74:24 The ball is swung over by Antonio Valencia, clearance made by Radosav Petrovic. Inswinging corner taken from the left by-line by Luis Nani, clearance made by Morten Gamst Pedersen. Shot from deep inside the area by Antonio Valencia clears the crossbar. 73:37 Michael Carrick takes a shot. Blocked by Grant Hanley. Inswinging corner taken by Luis Nani from the left by-line, clearance by Christopher Samba. 73:28 Patrice Evra sends in a cross, Grant Hanley manages to make a clearance. A cross is delivered by Ji-Sung Park, Grant Hanley manages to make a clearance. 72:18 Danny Welbeck takes a shot. Blocked by Mauro Formica. Corner taken right-footed by Luis Nani to the near post, clearance by Ayegbeni Yakubu. 71:57 Rafael Da Silva crosses the ball. 71:50 Antonio Valencia delivers the ball, clearance by Radosav Petrovic. 70:46 Mauro Formica takes a shot. Blocked by Michael Carrick. Corner taken by Morten Gamst Pedersen from the right by-line, Grant Hanley has a headed effort at goal from close in which goes wide of the left-hand upright. 69:51 Luis Nani delivers the ball, Danny Welbeck has an effort at goal from close range which goes wide of the left-hand upright. 67:10 The ball is crossed by Antonio Valencia, Headed effort from inside the area by Phil Jones misses to the right of the goal. 66:09 Dimitar Berbatov produces a cross, clearance made by Christopher Samba. 66:01 Luis Nani produces a cross. 65:02 Dimitar Berbatov delivers the ball, Grant Hanley manages to make a clearance. 64:47 The ball is crossed by Dimitar Berbatov, clearance by Grant Hanley. 64:14 Luis Nani takes a outswinging corner from the right by-line played to the near post. 64:05 Antonio Valencia produces a cross. 63:42 Mauro Formica delivers the ball, Phil Jones manages to make a clearance. 62:42 Luis Nani produces a cross. 62:18 Josh Morris crosses the ball. 61:06 Assist by Antonio Valencia. 61:06 GOAL - Dimitar Berbatov:Man Utd 2 - 2 Blackburn Dimitar Berbatov finds the back of the net with a goal from inside the penalty box to the bottom right corner of the goal. Man Utd 2-2 Blackburn. 60:45 Centre by Rafael Da Silva. 60:37 The ball is crossed by Luis Nani, clearance made by Grant Hanley. 55:59 The ball is sent over by Luis Nani. 55:37 Direct free kick taken by Oliveira Anderson. 55:37 Booking The referee shows Radosav Petrovic a yellow card for unsporting behaviour. 55:33 Radosav Petrovic concedes a free kick for a foul on Oliveira Anderson. 53:47 Substitution Josh Morris is brought on as a substitute for Ruben Rochina. 53:47 Patrice Evra crosses the ball, Mark Bunn makes a save. Inswinging corner taken by Luis Nani from the left by-line, Headed effort on goal by Michael Carrick from inside the penalty box misses to the right of the goal. 53:31 Antonio Valencia sends in a cross. 51:27 Assist on the goal came from Rafael Da Silva. 51:27 GOAL - Dimitar Berbatov:Man Utd 1 - 2 Blackburn Dimitar Berbatov finds the back of the net with a headed goal from inside the six-yard box. Man Utd 1-2 Blackburn. 50:13 GOAL - Ayegbeni Yakubu:Man Utd 0 - 2 Blackburn Ayegbeni Yakubu scores a goal from inside the penalty area low into the middle of the goal. Man Utd 0-2 Blackburn. 49:20 Effort on goal by Luis Nani from just outside the penalty area goes harmlessly over the target. 48:30 Oliveira Anderson concedes a free kick for a foul on Ruben Rochina. Free kick taken by Mark Bunn. 46:57 Antonio Valencia sends in a cross, blocked by Grant Hanley. Outswinging corner taken right-footed by Luis Nani from the right by-line, free kick awarded for a foul by Michael Carrick on Mark Bunn. Mark Bunn takes the free kick. 46:07 The free kick is delivered right-footed by Luis Nani from left by-line, clearance made by Radosav Petrovic. 46:07 Booking Jason Lowe receives a caution for unsporting behaviour. 46:03 Luis Nani fouled by Jason Lowe, the ref awards a free kick. 45:01 Substitution Oliveira Anderson comes on in place of Javier Hernandez. 45:00+3:12 The first half comes to an end. 45:00+2:22 Inswinging corner taken right-footed by Luis Nani, clearance by Morten Gamst Pedersen. 45:00+2:15 Centre by Luis Nani, blocked by Jason Lowe. 45:00+2:06 Corner taken short by Luis Nani. 45:00+2:00 The ball is delivered by Patrice Evra, Steven Nzonzi gets a block in. 45:00+0:55 Corner taken right-footed by Luis Nani from the left by-line to the near post, Steven Nzonzi makes a clearance. 45:00+0:51 The ball is crossed by Luis Nani, clearance made by Christopher Samba. 45:00+0:25 Luis Nani sends in a cross, Mark Bunn makes a comfortable save. 45:00+0:14 Luis Nani decides to take the corner short. 45:00+0:02 Shot from 6 yards from Javier Hernandez. Save made by Mark Bunn. 44:32 Steven Nzonzi gives away a free kick for an unfair challenge on Rafael Da Silva. Free kick crossed right-footed by Luis Nani. 43:45 Effort on goal by Luis Nani from 18 yards. Save by Mark Bunn. 41:38 Ruben Rochina produces a left-footed shot from just outside the box that misses to the right of the target. 40:57 Ji-Sung Park delivers the ball, clearance by Grant Hanley. 36:49 Effort on goal by Luis Nani from long distance goes over the crossbar. Correction - 35:04 Free kick awarded for a foul by Dimitar Berbatov on Steven Nzonzi. Mark Bunn takes the free kick. 35:04 Dimitar Berbatov gives away a free kick for an unfair challenge on Steven Nzonzi. Free kick taken by Mark Bunn. 32:15 Outswinging corner taken by Morten Gamst Pedersen from the left by-line, free kick awarded for an unfair challenge on David De Gea by Ayegbeni Yakubu. David De Gea takes the free kick. 31:30 Effort on goal by Luis Nani from just inside the penalty box goes harmlessly over the target. 31:04 Antonio Valencia crosses the ball, clearance made by Christopher Samba. 30:47 Antonio Valencia produces a cross, Adam Henley gets a block in. 29:51 Mauro Formica has an effort at goal from outside the penalty box which goes wide left of the goal. 28:37 Javier Hernandez has shot on goal from just outside the penalty box which goes wide of the right-hand upright. 26:39 Corner taken right-footed by Luis Nani from the left by-line, Phil Jones has an effort at goal from 6 yards. Mark Bunn makes a brilliant save. 26:29 Shot by Danny Welbeck. Blocked by Christopher Samba. 26:04 Effort from 35+ yards by Ruben Rochina. Save made by David De Gea. 23:42 The ball is sent over by Luis Nani, comfortable save by Mark Bunn. 23:17 Ruben Rochina concedes a free kick for a foul on Luis Nani. Luis Nani takes the direct free kick. 22:46 The free kick is delivered right-footed by Morten Gamst Pedersen from right channel. 22:46 Booking Booking for Michael Carrick for unsporting behaviour. 22:18 Michael Carrick concedes a free kick for a foul on Mauro Formica. 21:33 Free kick awarded for a foul by Ayegbeni Yakubu on Phil Jones. David De Gea restarts play with the free kick. 20:10 Drilled right-footed shot by Rafael Da Silva. Comfortable save by Mark Bunn. 20:05 The ball is delivered by Patrice Evra, clearance made by Steven Nzonzi. 19:17 Phil Jones produces a drilled right-footed shot from 25 yards. Christopher Samba gets a block in. 18:14 Free kick awarded for a foul by Adam Henley on Rafael Da Silva. Luis Nani takes the direct free kick. 15:29 The assist for the goal came from Christopher Samba. 15:29 GOAL - Ayegbeni Yakubu:Man Utd 0 - 1 Blackburn Ayegbeni Yakubu scores a power penalty. Man Utd 0-1 Blackburn. 14:34 Penalty awarded for a foul by Dimitar Berbatov on Christopher Samba. 13:49 Mauro Formica fouled by Patrice Evra, the ref awards a free kick. Free kick taken by Mark Bunn. 12:33 Corner taken right-footed by Luis Nani from the right by-line to the near post, Radosav Petrovic manages to make a clearance. 12:27 The ball is crossed by Antonio Valencia, Grant Hanley gets a block in. 12:06 Effort on goal by Rafael Da Silva from 25 yards. Blocked by Grant Hanley. 12:00 Patrice Evra produces a cross. 10:38 Mark Bunn takes the free kick. 10:38 Booking Luis Nani is cautioned. 10:33 Luis Nani challenges Ayegbeni Yakubu unfairly and gives away a free kick. 9:32 Radosav Petrovic gives away a free kick for an unfair challenge on Patrice Evra. Free kick taken by Luis Nani. 6:29 Shot from just outside the penalty area by Luis Nani misses to the left of the target. 4:52 Drilled right-footed shot by Luis Nani. Grant Hanley gets a block in. 4:01 Free kick awarded for a foul by Phil Jones on Mauro Formica. Direct free kick taken by Mark Bunn. 3:10 Luis Nani takes a outswinging corner from the right by-line played to the near post, clearance by Grant Hanley. Correction - 1:54 Ruben Rochina concedes a free kick for a foul on Ji-Sung Park. Direct free kick taken by Michael Carrick.